Ennio Morricone and Quentin Tarantino love her: Elisa tells us how she became an icon always being herself. This is the beginning of our trip in Q Magazine, where you’ll meet Robert Mapplethorpe, the legend of LGBT photography who lived where Bob Dylan lived and went to the inauguration of its most famous exhibition dressed with a studded jacket and a smoking with cufflinks. Our travels are told by big names of Italian journalism and will bring you from Toronto to Estonia, passing through the Zurich of Conchita Wrust. 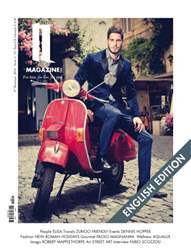 The shooting gets the color of an old red Vespa, a style icon. Q Magazine is for everybody, that’s why it’s unique.